Today our expert guest is Tim Rhode, co-founder of both 1Life Fully Lived and GoBundance. 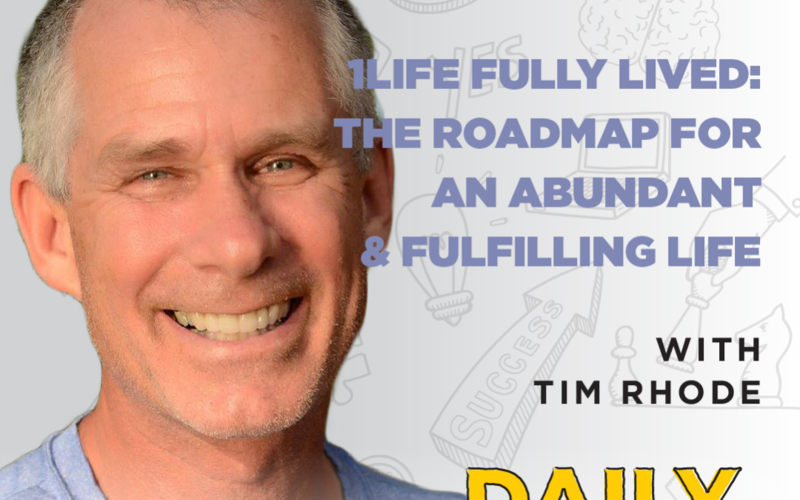 We talk about what those organizations are, how they’re changing lives, and why Tim is inspired to help others develop their own life plan to create a world of abundance and balance. Although Tim is tremendously successful today, he had a bit of a rough start to life. A turbulent home life led to him barely graduating high school, and at 25, he was a part-time grocery clerk who had to go door-to-door painting addresses to pay the bills. He developed a poverty mindset early in life – and it wasn’t until developing an interest in real estate, and seeing how it could create new opportunities for him, that Tim started to shake that mindset. 1Life Fully Lived is a nonprofit organization started that gives people of all ages and backgrounds the tools to achieve life mastery. By leveraging the knowledge and support of their community, they provide life-planning tools and training in goal setting, finance, relationships, and wellness so that anyone can create and live their best life. Who the heck am I at my core? What’s my plan? How will I fund this dream? How will I be healthy in my mind, body, and spirit to pull it off? And who’s in my tribe to help me achieve this magnificent life that I was blessed to live? Tim encourages everyone to live multiple incarnations in their life; different chapters of your life story.